I absolutely LOVE to bake. It's very soothing to me. It makes me feel creative (even if it's the five hundredth time I've made the same dish.) 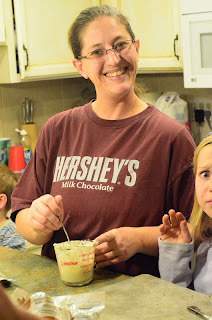 And I love to eat the finished product...probably more than I should sometimes. I was lucky enough to snag my sister in law's kitchen this thanksgiving and my niece and I made some yummy cake balls, so I'm not feeling totally deprived, but unfortunately, you can't bake much in a hotel. As much as the staff loves us here, I'm not sure how they'd feel about me taking over the kitchen for the day. 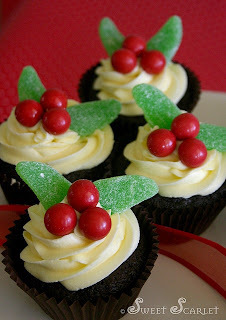 I love the simple elegance of these cupcakes from Sweet Scarlet's flickr stream. These Rudolph Reindeer cupcakes from Welcome Sunshine Home would make a fun and easy addition for the kids. 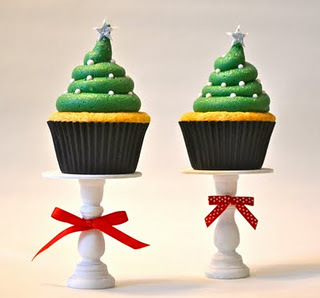 Lula Loves has the right idea on the ratio of cupcake to frosting with these cute Christmas Tree cupcakes. I personally can't wait to try all three of these. I think after the lack of baking the last few months, everyone on my Christmas list will be getting some sweet treats this year!